Birds are awesome, right? We encourage you to be a part of the solution for conservation for our feathered friends and live bird friendly! Check out these tips provided by our partners at Wild Birds Unlimited, or get more info on bird-friendly living on our blog. 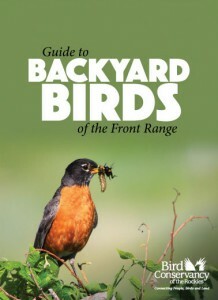 Check out our latest publication, the Guide to Backyard Birds of the Front Range. Knowing which birds live in your area and being able to identify exactly which ones are visiting your yard is the first step to creating a truly bird friendly habitat around your home. Become a Neighborhood Nestwatch citizen scientist and connect with birds in your home landscape while simultaneously making a meaningful contribution to bird conservation and research. This program brings Bird Conservancy of the Rockies biologists to backyards in the Denver area to gather information about local birds and train volunteers to become citizen scientists. This information is used by scientists studying the effects of urbanization on birds, nesting success, and annual survival rates over time. Learn more on our Neighborhood Nestwatch page. The Rocky Mountains and Great Plains are wonderful for feeding and observing birds – more than 490 of North America’s 900-plus species have been sighted in Colorado alone. Our avian amigos face survival challenges just about every waking hour. To usurp Kermit the Frog’s slogan, “It’s not easy being feathered.” Fortunately, we can assist in birds’ survival and enhance our own enjoyment of backyard birding at the same time. When our winter garden is dreary and snow-covered, birds can be its flowers, bringing their beautiful colors and calls to our naturescape. Incorporating the four criteria essential for birds’ survival into our backyard habitats can increase the number of species we see and, in some small way, aid in their survival. For example, University of Wisconsin studies have shown that when night temperatures approach zero, the survival rates more than double for chickadees that have access to healthful food in bird feeders during the day. The four criteria for a bird-friendly backyard habitat are food, cover, water and a place to raise a family. 1. Food: Provide high-fat, high-protein foods in feeders. Oil sunflower seed has the broadest appeal of any seed offered by Wild Birds Unlimited. Nearly 80% of seed-eating birds prefer this seed. White proso millet is the second most favored seed. Millet will be kicked to the ground to be eaten and is best fed in a tray feeder near the ground. Juncos, sparrows, towhees, doves and others will feed on millet. Safflower is great for doves, chickadees and finches, but squirrels, grackles and starlings do not care for it, so it is a good problem-solver if these birds and furry filchers are monopolizing your feeders. Birds like flickers, downys, chickadees and nuthatches that eat both seed and insects will feed on peanut kernels and suet, which is rendered beef kidney fat, while jays, magpies and other corvids prefer to pick over peanuts in the shell. Raisins, cranberries and cherries are attractive to robins and other fruit eaters. Orange halves should be offered from May through September for our Bullocks Orioles and Western Tanagers. 2. Cover: Plantings are crucial in determining who visits our yards. Not only do properly selected plants provide food, they also yield much-needed shelter from the elements and cover from predators. Bird Conservancy of the Rockies encourages using native plants whenever possible. 3. Water: Water is second only to food in the number of species it attracts. It is especially important to have an open water source when all else is frozen. Birds will bathe in sub-freezing temperatures. (We think this is where the term bird-brain originated.) Actually, it is essential that they keep their feathers clean and fluffed, which enables them to more efficiently trap insulating air next to their bodies to keep warm. Open water also slakes their thirst while ingesting snow can be dehydrating. A bird bath filled with water on a winter day can stay open for quite some time. There are also thermostatically controlled heated birdbaths and birdbath heaters available at birdfeeding specialty stores. The heater will come on when the water temperature hits 35 degrees and will turn off at about 45 degrees for energy efficiency. 4. A place to nest: The final element birds are looking for is a suitable place to nest. Backyard vegetation can serve this purpose well. With fewer wooden fence posts and our propensity to quickly remove dead trees, it is becoming harder for cavity-dwellers to find nesting sites. Nesting boxes or bird houses fill this niche. In selecting or building a house, we need to research the specific dimensions for the species we want to attract. It is amazing to see the birds out there with their little tape measures making certain the house fits their needs. The floor size, height of the entrance above the hole and the entrance hole size will determine who uses the house. Unfortunately, many birdhouses on the market are terrible for the survival of bird families. When selecting a birdhouse, make certain it has good ventilation and good drainage, is made of non-toxic materials and finishes, and does not have a perch on the front. Predators love perches. Cavity-dwellers don’t need them. The house should be easy to clean out. Removing the old nest will help keep parasites out and help yield healthy feathered families. Once you’ve supplied a suitable backyard bird habitat, it’s time to grab the binoculars and field guide and drink in the beauty that nature provides. Birds don’t mind our voyeurism. After all of the kindness we have provided, it would be rude for them to regard us as paparazzi. Another aspect of bird-friendly living is keeping our cats inside where both the cats and the birds are safer. Cats have been estimated to kill 2 million birds a day in North America. Wild Birds Unlimited stores specialize in bird feeders, birdbaths, houses, field guides, nature-related gifts, binoculars and quality seed blends.